You may receive updates from Stop Gun Violence in Our Schools, The Badass Teachers Association , National Education Association, Network for Public Education , and AFT Activist, the sponsors of this form. I pledge to join students, parents, educators, administrators, school staff and other community leaders on April 20, 2018 in making my voice heard by taking action to end gun violence in our schools and communities. Enough is enough! We can no longer stand by silently while gun violence continues to threaten the safety of our students, schools and communities. We demand that leaders take action to pass comprehensive laws to end gun violence NOW! Pledge to join us and you'll receive updates about actions in your community. Find events in your area or sign up to host an event here create your own event here! 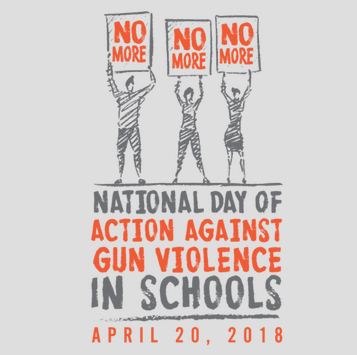 What is the National Day of Action Against Gun Violence in Schools? No more children murdered in school. No more parents sending a child to school who never comes home. No more teachers, coaches, principals, librarians or any school staff standing between students and a gunman. No more. We call on every school community in America to join us—in the way that makes sense for you—to demand that our leaders take real action to end gun violence. On April 20, 2018, the 19th anniversary of the Columbine Massacre, we will stand together in our communities to demand that our elected leaders take meaningful action to stop the violence that is tearing apart our schools and our communities. We know that this problem can be solved. America is one of the few nations where mass-shootings are commonplace. Mass murder in our schools is not a predetermined outcome—it is a consequence of decisions made by our elected leaders. The problem extends beyond mass shootings. Gun violence affects the lives of our students far too often, inside and outside of schools. Too many youth, especially in communities of color, are affected by gun violence on a daily basis. It is far past time for our leaders to take real action when it comes to gun violence.Because they have not, we must.